Ever felt that feeling of being overwhelmed in the drug store? I have and this time I wasn’t even asking for it. My horror show began when I decided to walk into my local drug store to look for an eye liner, since mine is literally one swipe away from dying. As I’m browsing for the perfect one my eyes keep getting drawn to the foundations. I’ve never been one to wear any but I’m always a curious one to look and see what kind of flawless coverage a girl can get. As I’m jumping from brand to brand yes blame my ADD I start feeling overwhelmed instantly like I couldn’t believe how many foundations are out there. And not only that they all have letters of the alphabets attached to them! Now I’m feeling like the walls are closing in on me, I had to get out there! I left the drugstore feeling exhausted and without my eyeliner. Mind you I was only in there for 10 minutes. I know my story is a bit exaggerated but I must not be the only one who way feels this way right? but I realized something it isn’t drug stores fault for carrying tempting to buy foundations (LOL) it was simply just a lack of not being educated on my part regarding all these new creams. So today I decided to bring you some information and the break down on these creams so the next time you’re in your local drugstore the paramedics don’t have to carry you out! What is it? Short for beauty balm or blemish balm, BB creams are the love child of makeup and skin care. While its benefits seem to be endless, at its bare bones BB cream is the world’s best tinted moisturizer, packed with tons of benefits as well as SPF. How to use it: Although it may have SPF, don’t douse your face with it the way you do sunscreen—a light layer is all you need. BB creams can also be used as a primer, moisturizer, and foundation! How it differs: BB cream provides the least amount of coverage of all the alphabet creams, so it’s perfect for a younger woman whose skin needs a little pick-me-up! What is it? Fresh to the alphabet cream craze, DD creams, or “dynamic do-all” are a super cream: They combine the power and benefits of both BB and CC creams. However, their primary focus is anti-aging. For those of you who are a little more visual check out this great chart I found! 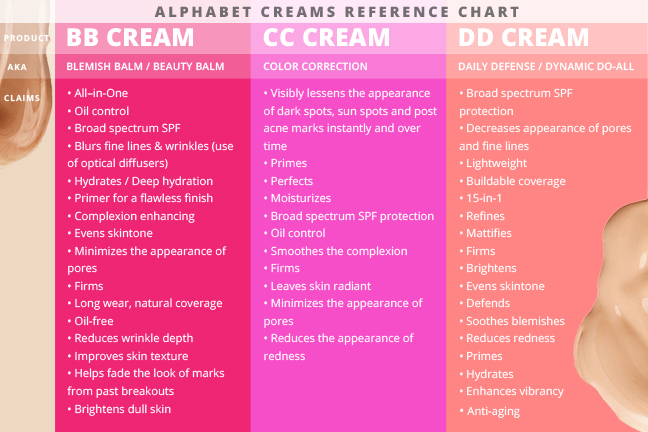 Now that you have the info on BB, CC, and DD creams, will you be using any? Or if your currently using any let me know how it’s going for you! Leave a comment below. Look Inside Yourself, Not Your Handbag!